The Ministry of Human Resource Development, Government of India has notified following two changes in the JEE pattern for 2019: 1. There shall be no weightage for the 12th class marks in calculating the ranks in the JEE (Main) examination, 2. For the candidates to qualify for the admission in the IITs/NITs/IIITs and such other CFTIs whose admissions are based on the JEE (Advanced)/JEE(Main) ranks, they should have secured at least 75% marks in the 12th class examination, or be in the top 20 percentile in the 12th class examination conducted by the respective Boards. For SC/ST students the qualifying marks would be 65% in the 12th class examination. The NTA has released an information bulletin for the Joint Entrance Examination (JEE) mains 2019. Candidates who wish to appear for the exam can download the information from the official website (jeemain.nic.in). The exam will be in the computer-based mode form January 06 to 20, 2019. The exam will be in the computer-based mode form April 06 to April 20, 2019. The entire application process will take place online and candidates will be required to upload their Aadhaar numbers in order to authenticate their identities. Step 2:On the homepage, under the "Current Events" column, click on the notification titled "Remove Discrepancy in Uploaded Image(s)"
The number of attempts for JEE Main is limited to 3. Admission criteria to undergraduate engineering programs at NITs, IIITs, Other Centrally Funded technical institutions, institutions funded by participating state governments, and other institutions shall include the performance in the class 12/equivalent qualifying examination and in the Joint Entrance Examination, JEE (Main). The Paper 1 (BE/BTech) of JEE (Main) will also be an eligibility test for the JEE (Advanced), which the candidate has to take if he/she is aspiring for admission to the undergraduate programmes offered by the IITs. Candidates need to score at least 75 per cent in their class 12 board examinations or be in the top 20 percentile of their Boards to be eligible for JEE main or advanced. For candidates of the SC and ST categories, this has been lowered to 65 per cent. JEE advanced further requires that the candidates score high in JEE main and rank among the top 2,24,000 candidates. Joint Entrance Examination(Main) 2018: For JEE(Main)-2018, Only those candidates who have passed their Class 12th Exam or any equivalent qualifying examination in 2016 or2017; or those who are appearing in their Class 12th Exam or any equivalent qualifying examination in 2018 are eligible to appear in JEE(Main)- 2018. Candidates who passed Class 12th/Qualifying examination in 2015 or before as well as those who will appear in such examination in 2019 or later are not eligible to appear in JEE (Main) 2018. Candidates who appeared in class 12th/equivalent qualifying Examinations in 2015, did not pass in 2015, but passed in 2016 are also not eligible to appear in JEE (Main) 2018. The candidate must have been born on or after October 1, 1993. Candidates interested in applying need to be intermediate or class 12 pass from a recognised board and must have appeared and qualified in class 12th examination in 2016 or 2017 or should appear in the class 12 examination in 2018. Moreover, NTA has made it mandatory to have an Aadhar card to apply for the exam. Candidates who already have an Aadhar card will have to enter their aadhar number in their application form. Those who have applied for their Aadhar but have not received it yet will have to provide Aadhar enrolment id in the application form. The exam fee ranges from Rs 1,000 for general category boys to 250 for the reserved category. For those appearing for both paper 1 and paper 2, the fee ranges from Rs 1,800 to Rs 650. 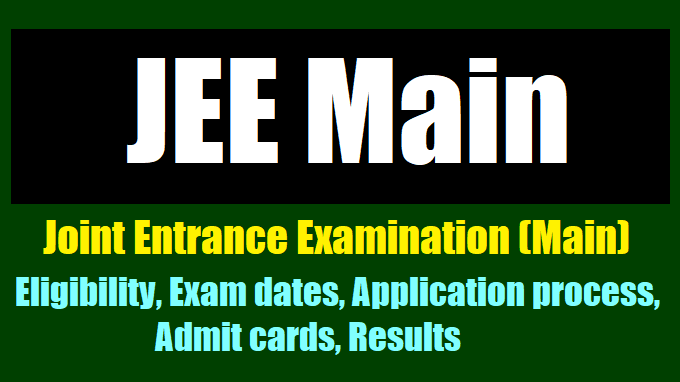 The Joint Entrance Exam (JEE) Main 2019 information bulletin is out and engineering aspirants who plan to appear in the exam can submit their application forms as per schedule. NAS, exam conducting body, had already announced the exam date for offline and online modes. Candidates have to keep in mind that since last year, NTA has made Aadhaar card mandatory for registration. Paper 1 is for candidates appearing for admission to BE and BTech courses. It will contain objective type questions (both online and offline) in physics, chemistry and mathematics. Paper 2 is conducted for students who wish to pursue BArch or BPlan. This paper will solely be conducted in the pen and paper mode and will include objective type questions in mathematics, an aptitude test and a drawing test. The papers will be conducted in English and Hindi mediums, except in Gujarat, Daman&Diu and Dadra and Nagar Haveli where the paper will also be conducted in Gujarati. The exam will be held in compuer-based mode. This year the entire JEE Advanced exam will be conducted in a computer-based test mode. The examination will consist of two papers - Paper 1 and Paper 2 -and each of the papers will be held for a three hours duration. The aspiring candidates are requested to download the information bulletin from above mentioned website only and read the same carefully before applying. The eligibility criteria for JEE (Main) & JEE (Advanced) are different. The candidates are requested to read the information bulletin carefully and ensure their eligibility as per the criteria laid down for JEE (Main) and JEE (Advanced). The aspiring candidates have to apply online only through JEE (Main) website www.jeemain.nic.in. The online application process has been started. JEE Main 2019 - Important notice released for candidates who have already filled the online application form: The National Testing Agency, NTA has released an important notice for candidates who have already filled the online application form for JEE Main 2018. JEE or Joint Entrance Examination online application forms are not available on the official website jeemain.nic.in. Aspirants can fill the online application form. The notice released on the website, however, is for the candidates who have filled the online application forms already. The notice released on the website has asked candidates to log in and correct the images uploaded. Please note, applicants are required to upload their photograph as well as their signatures. The notice has asked candidates to correct the images uploaded on the server by using their registered mail id and password. For the students who have not filled the application form as yet, the specifications for the images is provided below. All students are again informed that the JEE Main 2018 online application form is available on the official website jeemain.nic.in. Interested candidates are required to fill the form on the official website. No offline or paper applications would be accepted. JEE Main 2018 is scheduled from January 06 to 20, 2019, and JEE Main 2019 is scheduled from April 06 to 20, 2019 for its Online mode exam. For the online or computer-based exam. The examination of JEE (Main) - 2019 in CBT Online mode will be conducted from January 06 to 20, 2019. The aspiring candidates have to apply online only through JEE (Main) website www.jeemain.nic.in. The online application process will start from 01st September, 2018 onwards. The last date for application is 30th September, 2018 and fee can be paid up to 02nd January 2019. About JEE Main 2019: The Joint Entrance Exam is conducted every year for candidates seeking admissions in Under Graduate Engineering programmes in the prestigious IITs, NITs, IIITs and various other CFTIs (Centrally Funded Technical Institutions) across the country.